Turn on iCloud, Google, Exchange, or Yahoo! calendars. Go to Settings > Mail, Contacts, Calendars, tap an account, then turn on Calendar. Add a CalDAV account. Go to Settings > Mail, Contacts, Calendars, tap Add Account, then tap Other. 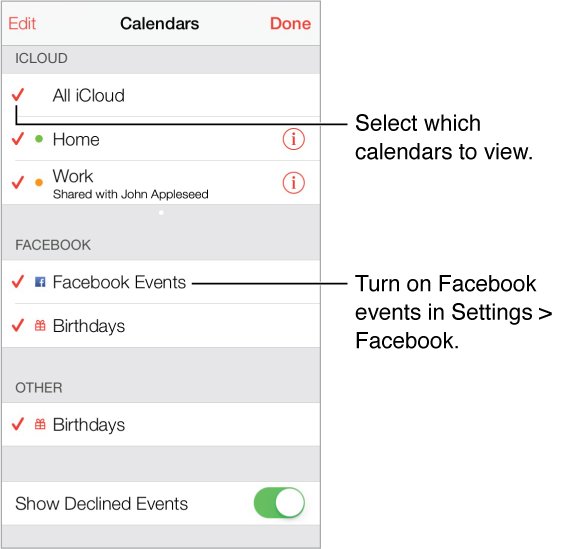 Under Calendars, tap Add CalDAV Account. Subscribe to a calendar. Go to Settings > Mail, Contacts, Calendars, then tap Add Account. Tap Other, then tap Add Subscribed Calendar. Enter the server and filename of the .ics file to subscribe to. You can also subscribe to an iCalendar (.ics) calendar published on the web, by tapping a link to the calendar. View the Birthdays calendar. Tap Calendars, then tap Birthdays to include birthdays from Contacts with your events. If you’ve set up a Facebook account, you can also include your Facebook friends’ birthdays. View the Holidays calendar. Tap Calendars, then tap Holidays to include national holidays with your events. See multiple calendars at once. Tap Calendars, then select the calendars you want to view. Move an event to another calendar. Tap the event, tap Edit, then tap Calendars and select a calendar to move it to.